Oh tomato season, how do I love thee? Let me count the ways. That glossy skin, that succulent flesh, that luscious flavor… tomatoes really are an amazingly delicious and versatile addition to any meal. And in my humble opinion, nothing beats an oven roasted tomato. The process of roasting brings out the natural sweetness in the tomatoes and creates a rich, complex flavor. 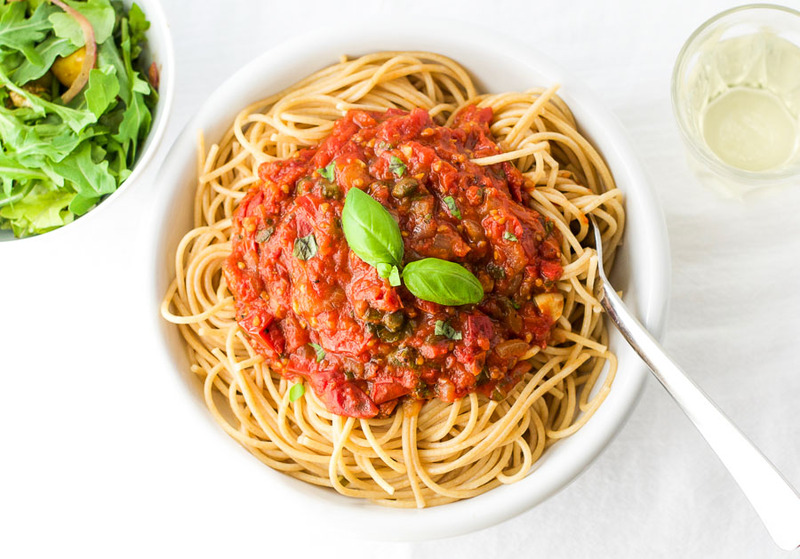 When combined with capers, red onion, garlic, balsamic vinegar, and olive oil, the result is this mind-blowing (yes, truly) oven roasted tomato sauce that is perfect when paired with whole wheat spaghetti and a crisp green salad. The other wonderful thing about roasting tomatoes is that it increases the bioavailability of the antioxidants in the fruit. Tomatoes are well known for their lycopene content. Lycopene is a phytochemical that acts as an antioxidant in the body. 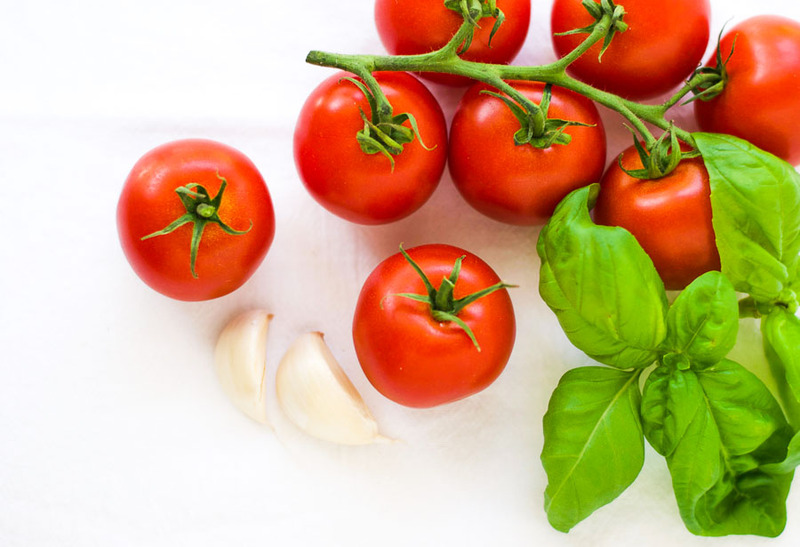 It turns out that the lycopene in cooked or processed tomatoes is more available to the human body than in raw tomatoes. So by roasting your tomatoes, you are actually increasing the antioxidant activity of your food. 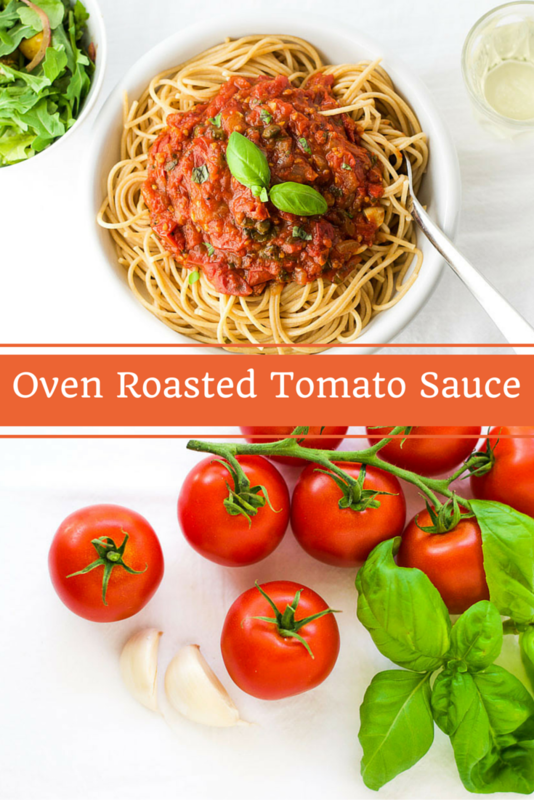 And while it does mean that this oven roasted tomato sauce requires a little forethought due to the cooking time required, most of that time is inactive so you won’t be spending all afternoon working over a hot stove. Put the tomatoes, red onions, garlic, and capers in a large roasting dish. Drizzle over the olive oil, balsamic vinegar, and a few grinds of black pepper, and stir gently. Place in the oven for 1.5 - 2 hrs until soft and slightly caramelized around the edges. When the tomatoes are cooked, remove them from the oven, add the tomato paste and stir well. Mix in the basil and adjust seasonings as necessary. Meanwhile, cook the spaghetti according to the instructions on the packet. 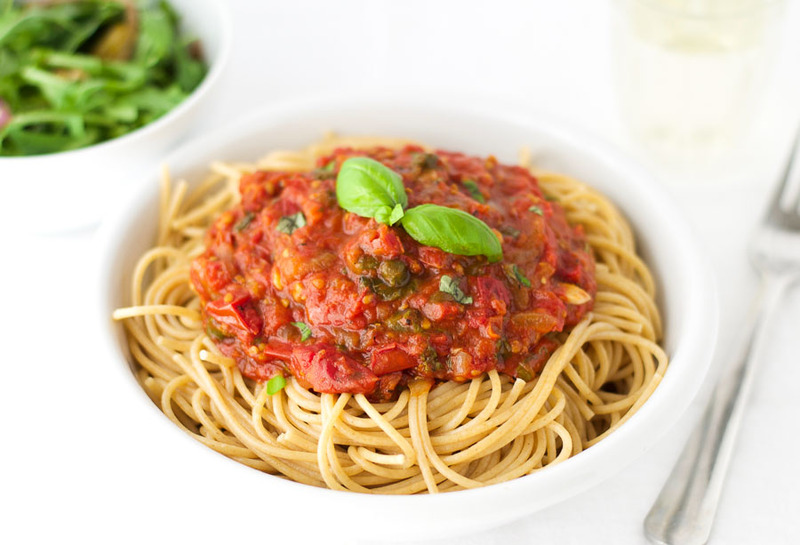 Serve the sauce over the spaghetti with parmesan and a crisp green side salad. Love the freshness! Healthy eating in action. Thank you Kelsey. It was so wonderfully easy to make. I hope you like it. I can’t stop thinking of this spaghetti since I saw this on Instagram. It looks amazingly delicious!!! Aww thanks Evi 🙂 I have to say, I was surprised by just how tasty it turned out. Oven roasting the tomatoes made a world of difference to the final flavor. I LOVE home-made tomato sauce, it tastes so much better than the stuff you get in the tin! This looks beautiful! Thank you Lucie! I agree – homemade is SO much better. This sounds absolutely delicious! Perfect blend of flavors! Thanks so much for sharing on the Healthy Living Link Party 🙂 We will be featuring your recipe tonight so make sure you stop by for your “featured” button! Have a great day!